Better Buzz started 12 years ago with a cart that has grown to 6 locations. How’d they do it? Selecting good beans to begin with…organic, fair trade beans. These beans are locally roasted & baristas well trained at their Vista headquarters. Friendly baristas are part of their success, too. Put this all together & you get a better cup of coffee, or as they say, a better buzz. I prefer strong, black coffee, which they do very well. But every now & then a flavored coffee captures by interest. They offer a drink called The Best Coffee Ever. The skeptical side of me wasn’t interested, but then I overheard a couple in line behind me raving about it. So the curious side of me asked the barista just what was the secret ingredient to make it the best coffee ever. “Vanilla powder” was her answer. “That’s it?” I replied. So of course I had to try one. I tweaked my order a bit by getting half the amount of this magic powder…perfection! Lucky for us there are 3 Better Buzz shops near our homes: Mission Beach, Pacific Beach, and Point Loma. I prefer the one in Mission Beach for the neighborhood vibe. Maybe it’s because there’s no drive-thru at this one…most of their customers live within walking or biking distance. It’s also enjoyable to sit at their front window & watch the beach traffic go by. But Point Loma works if I need a quick coffee to go. While I haven’t been to the other locations, they are Encinitas, Fashion Valley, and San Marcos. Their headquarters in Vista is where their beans are roasted & barista lessons given. Call for an appointment (760-542-6397) or fill out a barista application online (http://www.betterbuzzcoffee.com/careers). You can also get coffee preparation training at their Ivy League Barista Academy (http://ilbacoffeeschool.com/) in Vista. Better Buzz Coffee is certified by CCOF (California Certified Organic Farmers) as an Organic Coffee Roaster and strives to source Fair Trade and Rainforest Alliance coffees. 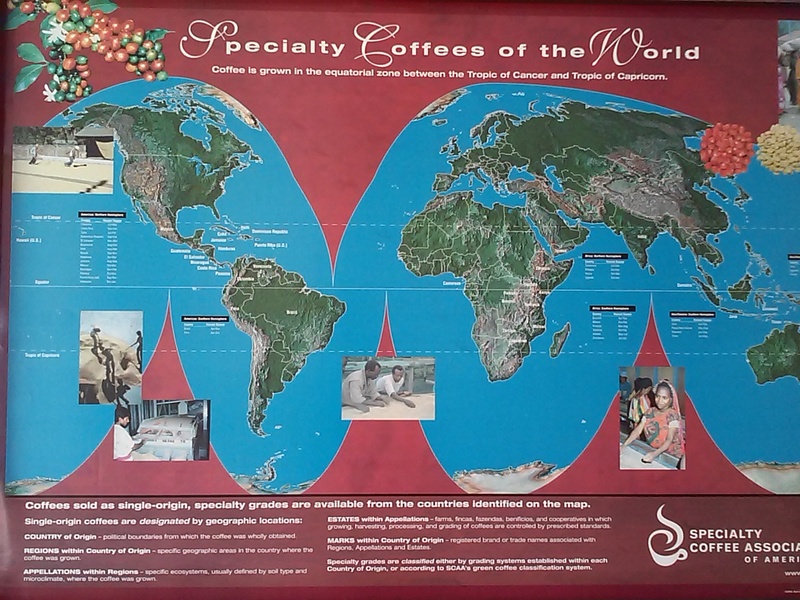 Check out the Specialty Coffee Assn. of America (www.scaa.org) for coffee facts, merchandise, & trips. This entry was posted in Coffee shops in North County, near the beach and tagged barista training, coffee school, Mission Beach, Pacific Beach, Vista. Bookmark the permalink. Good review. I need to try it. Do they serve any food?